It seems that everyone has that place in their home where "special treasures" are kept just in case. For some it may be a junk drawer in the kitchen, in my case it happens to be a tin that I keep in my laundry room for that occasional button that I find in the washing machine. I decided it was time to do something with my collection of mismatched buttons, bells and embellishments which have accumulated over the years. I had an old pillow sham which was lightly quilted and looked like it would be perfect for a snowman. I drew out a pattern approximately 7 inches tall, and shaped it to look like a snowman with the widest part being about 4 inches wide. I used my sewing machine to sew it from the outside so that I would have the rough edges which I was looking for. I lightly stuffed the body with a hand full of polyester fill, and then the fun began. 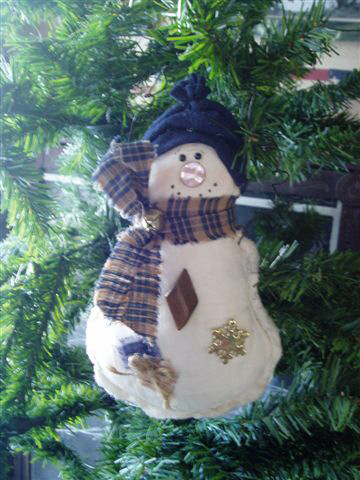 I opened my tin and started applying buttons, bells and trinkets on the body of my snowman with my glue gun. Using some scraps of fabric I had saved, I tied a piece around his neck for a scarf and cut 2 small pieces for patches on his body which I then glued a piece of twine to. My snowman's eyes and mouth are done with a black permanent marker. I used the heel of an orphaned sock for his hat which I glued on and ran a couple of stitches thru the top to gather it. I cut a piece of craft wire approximately 12 inches long, wrapped it around a pencil and poked it thru the fabric on each side under the scarf. The project took me about an hour start to finish and I would consider this to be an easy craft project that older children could do since most of it is done with glue. The body could also be done by hand, or turned right side out for a finished look. This ornament is a great idea since it is made totally from recycled items that I had on hand, but what makes it unique is the items are all from things that belonged to my family, right down to the bell which was on our cat's collar! Copyright © 2008 by Gwen Greenman. All rights reserved.